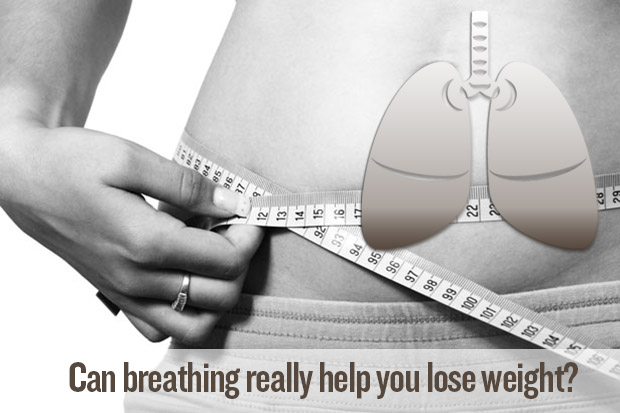 Can breathing really help you lose weight? It is aimed toward explaining that by looking at weightloss management while counting calories has always been an approach doomed to fail, since it precipitates the idea of control and restriction ... something our subconscious mind really doesn’t tolerate well. Instead it tries to explain the idea that the happy & ecstatic person that finds himself in the state of flow, is creating an internal feeling of calm and abundance and that this is the perfect solution that solves the century old puzzle to the weightloss. With this approach, we are able to enjoy ourselves to the fullest, while barely noticing we have actually reached our weight goals. Our BMI or body mass index is just a result of our overall state of body & mind. Breathing is the only bodily rhythm that we are able to consciously control. Arguably the most important aspect of mental and physical health and well-being is the respiratory process. The body is designed to get into state of equilibrium and all processes are fine tuned to do so and do it on their own. It will always adapt and serve efficiently to accommodate the body’s needs in any circumstances we find ourselves in. This also concerns breathing. Unfortunately even such an awesome super machine as our body can develop a lose screw. And breathing is not immune to such possible misalignment, especially if an individual is finding himself in a repeated stressful situations without effective releases … which is the case of over 80 % of western population. We know how to breathe. It is something that occurs to us automatically, spontaneously, naturally. We are breathing even when we are not aware of it. So it seems foolish to think that one can be told how to breathe. Yet, one’s breathing becomes modified and restricted in various ways, not just momentarily, but habitually. We develop unhealthy habits without being aware of it. We tend to assume positions (slouched positions) that diminishes lung capacities and take shortened breaths. So why is breathing so important? It has been suggested that the average individual can survive: 40 days without food, 4 days without water and 4 minutes without oxygen! Medical science has revealed an alarming fact 80 % of the population is breathing wrong - shallow & inefficient, chest only. Stress ... response creates a vicious cycle which through time results in a stressful and shallow "default” breathing pattern, producing 12 - 18 breaths a minute - while science tells us we need only 6 proper deep breaths in a minute to supply our needs. All the extra activity involved in our short, shallow breathing habits is robbing us of precious energy, producing toxic waste products and promoting a wide range of pulmonary & other diseases in our bodies and depression for our mind, further contributing to an ever more widely present "burnout syndrome”. Only slower and deeper breathing properly oxygenates your body, gets rid of toxins and gives your body a chance to properly maintain all functions. Independent studies have clearly demonstrated you can increase potential to live a longer and healthier life and avoid depression & disease. Effective and efficient oxygenation of the cells, tissues, and organs of our body is an absolute energy necessity. Our respiration cycles are governed by the autonomic nervous system. When your body is under stress you tend to take short, shallow breaths. Because these breaths only penetrate into the upper portion of the chest and lungs they are called "chest breaths.” This reduces your bodies’ ability to effectively oxygenate. This is appropriate in order to increase respiratory rate when you are under truly stressful situations, like being chased by a lion or sprinting on a track. However, when it continues for an extended period of time it sets up the pathological processes. Several studies have shown that heart disease, depression, anxiety, and chronic pain patients have an intimate relationship with persistent shallow, chest breathing behaviors. Several researchers have suggested maintenance of posture and breathing habits to be the most important factor in health and energy promotion. When we are emotional, breathing is on the "automatic pilot.” As we are focused on the object of our emotion, we hardly ever consciously register the close relationship between emotions and breathing. Even the tiniest mood change is reflected in our breathing. In case of sadness, suspense, conflict or depression, we under-breathe, "hold our breath,” so to say. While the negative emotions cause over-breathing, under-breathing, and other irregular breathing activity, the positive emotions cause breathing to be deeper, easier, and effortless. By the same functional relationship, when we restore our breathing to a deep, smooth, and rhythmical pattern, we can reduce the strength of negative emotions and acquire a peaceful and relaxing mental state. Nature has equipped us with a "fight of flight” emergency response for surviving against the enemy or danger. It has also provided us with a "calming” response, to restore peace and serenity, equally important for our survival. To enter the flow, we need to breathe correctly, moving toward a slower and deeper daily breathing pattern (diaphragmatic with prolonged exhalation) that replaces shallow "default” breathing. Progressively lowered breathing rhythm increasingly employs the relax centers in our nervous system and efficiently slows down and calms all the body systems, creating potential to experience the flow state. Constant fear and anxiety experienced and fueled by work stress, debt, relationships and daily overdose of information, is diminishing our mental and physical capacity and negatively influencing our breathing pattern. How so? When we are under stress, breathing accelerates. Breathing under stress expels higher levels of CO2 from the blood, as body is getting prepared to run away from attacking lion (anticipating CO2 increase because of anticipated physical effort needed to run away). But nowadays we don’t need to run, but still we prepare for an attack (any stressful situation you can imagine in today’s life is completely analogous to a lion attack) and then the CO2 doesn’t go up, because it doesn’t need to, but at this point we already expelled the CO2 in anticipation). When this is repeated and we can all witness it is undoubtedly getting repeated in our daily lives, it becomes chronic … we develop an overbreathing habit, which further aids to anxiety, burnout and depression that follows. Too low CO2 levels or hypocapnia creates cascade of problems down the line, since every process in our bodies requires uniquely fine tuned pH balance. Body is paying enormous attention to this balance, since even slight changes can be life threatening, so it is important that it works in a balanced fashion. For example, hypoxic cells generate free radicals, favor chronic inflammation and an acidic cellular environment. As a result, ineffective breathing adversely affects dozens, and maybe even hundreds, of chemical reactions in the human body. Proper oxygenation is absolutely crucial for body to work properly. Hyperventilation cannot increase blood oxygenation to any significant degree, but it reduces CO2 levels in the blood and other body cells. Therefore, you are not losing weight due to too fast and deep breathing, it is just that breathing under stress causes a lack of CO2 that is crucial for oxygen transport and normal blood circulation. CO2 is the most potent dilator of blood vessels. In addition, low CO2 levels in the brain make nerve cells irritable and overexcited. Because being under constant stress, having poor breathing and posture habits, experiencing severe lack of physical activity (all having it’s own set of negative side effects) etc., we breathe more than it is optimal and less efficient. As a result, we develop a reduced blood flow (perfusion) of all vital organs. In other words, the whole system is in the state of stagnation, delivery of O2 and nutrients, including glucose, is slow. As a result, we suffer from chronic fatigue and hunger. This causes more stress and overeating, which further intensifies our breathing. The body is a great equilibrium seeking work of art, but if you put the whole system under unhealthy level of constant and repeated stress, the whole will adapt to it and experience changes. The body changes every second of our existence, even more so our mind …we are not fixed entities and as such, we are prone to misalignment on all levels, physically and mentally. But luckily we have evolved the ability to control the vagal nerve, which can be influenced in conscious and unconscious way. There are tons of research papers proving, that we can influence our body chemistry through breathing and this also concerns body weight management. Breathing rhythm is extremely important since it is one of the few gateways into flow and one of the most potent active ingredients. Breathing rhythm is directly correlated to our nervous system, reflecting its every state. Therefore one of the most effective ways to boost the experience of flow is to use the ability to regulate breathing and manipulate it toward conscious, deep & slow diaphragmatic breathing pattern. To experience a more powerful flow in everyday life, we must keep breathing pace within the right frequency. It is defined as any breathing frequency below 10 breaths per minute, which triggers a parasympathetic response, which in effects triggers flow. Normal daily life breathing frequencies above 10 breaths per minute increase sympathetic nervous system response, which leads to flight or fight state, stress, anxiety and depression. This concerns normal activities of everyday living, where we don’t have extra demands for oxygen. In this way we have a powerful tool at our disposal to hack flow into higher gear. By effectively controlling stress response, we are also lowering our cortisol levels, a hormone that makes us want to eat and regain healthy feeling of hunger. 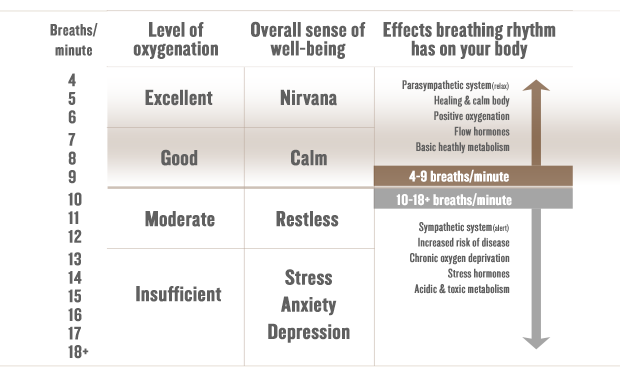 Breathwork systems like Nirvana® effectively produce the experience of flow states through a unique blend of interventions with mind blowing array of health & mental benefits, increasing your focus & deep presence & giving tools to perform better mentally & physically at all levels. 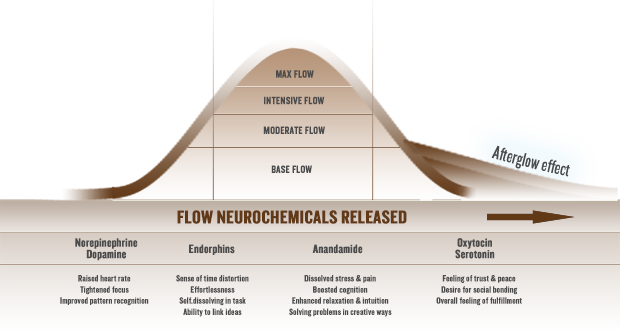 Breathing and other intervention pathways facilitate release of so called flow state neurochemicals that produce direct effects of calmness & focus while also contributing to the "afterglow” effect, an experience of a long term, lasting fulfillment. These neurochemicals flush our body, effectively driving it into the present moment, which produces the feeling of joy and satisfaction. It is important to cultivate & focus on this ... this state in itself creates perfect internal feeling of well-being ... and it is only a common sense that this is the state of the body & mind, where you don’t need to think about weight management, it will take care on it’s own. Just breathe & move ... Nirvana® is a perfect combination of both. It speeds up heart rate, improves muscle tension, triggers the release of glucose and giving us more energy. Neural efficiency is up. It gives us the feeling of engagement in a task. Dramatically increases attention, pattern recognition & muscle control. This pain reliever and "euphoric” feeling neurotransmitters are pretty strong, to say the least. There are 20 different types of endorphins, one of which is called beta-endorphins. These are 100 times more powerful than medical morphine. The word is taken from the sanskrit word ananda, which means "bliss, delight”. This endogenous (naturally found in our bodies) cannabinoid (a psychoactive compound found in marijuana). So this won’t come as a surprise; anandamide lifts moods, dilates blood vessels, bronchial tubes (adding in breathing), inhibits fear and improves our lateral thinking. Anandamide was found to do a lot more than produce a state of heightened happiness. It’s synthesized in areas of the brain that are important in memory, motivation, higher thought processes, and movement control. It plays a role in pain, appetite, and fertility. It also helps put the brakes on cancer cell proliferation and exhibits both anti-anxiety and antidepressant properties. Anandamide, like all neurotransmitters, is fragile and breaks down quickly, which is why it cannot produce a perpetual state of bliss. The "love hormone” derived from the greek word "quick birth”. Functions originally and associated solely with maternal behaviors or between sexual partners. However, recent findings point to a broader scope in human social bonding, trust and emotional behaviors. The vast majority of the body’s serotonin is found in the gastrointestinal tract. Serotonin affects mood, social behavior, appetite, digestion, sleep, memory and sexual desire. Studies have found that when serotonin has arrived, the state has already happened. Serotonin is also responsible for the afterglow effect. Conscious breathing influences our thoughts directly through channels we have already described. Our perception, our thoughts and feelings are what frequently results in a pathological abnormalities ... and this can be directly observed in an individual’s BMI. It goes well in hand with the prediction, that depression will be number 1 disability by 2020 on a worldwide scale. If breathing is so effective in calming thoughts, giving us more control over them, why wouldn’t we use it? After all, if situation is as critical as it seems, we should use all available tools at our disposal to alleviate ever more frequent mental disabilities & burnouts. While regaining more control over our racing thoughts, we are gaining more control over our impulses and while we are engaged into flow inducing activities, we effectively balance the body & mind as well as weightloss management. In case of Nirvana®, our brainwaves are directed toward the Alpha-theta wave bridge, which creates conditions for entering the flow state. We need to deactivate first, empty the full glass to become more present & activated into the optimal state. Nirvana® is an effective antidote for overcrowded & unproductive thoughts that clutter every second of our existence, for removing self defeating inner critic dialogue and learning how to downregulate the fast paced reality we are all experiencing. Finally, and yes of course, you need to burn calories too and adequate & safe physical activities are the perfect way to go. Nirvana® encourages and teaches gentle movement patterns which themselves are effective at burning calories. By combining the fat loss potential from proper oxygenation and hormone balance with relaxation and movement sequences, the Nirvana® System represents an extremely powerful and holistic approach to weight management. The bottom line of it all ... if you are in flow, healthy and happy, you don’t really need to be bothered with weightloss, since the happy and content body/mind with a healthy appetite and optimized metabolism will not overeat on anxiety. Weight gain is just a symptom of our body’s reward mechanisms trying to find that insufficient pleasure in food. Optimal weight will happen on it’s own ... just breathe ...move ... get into the flow ... enjoy! 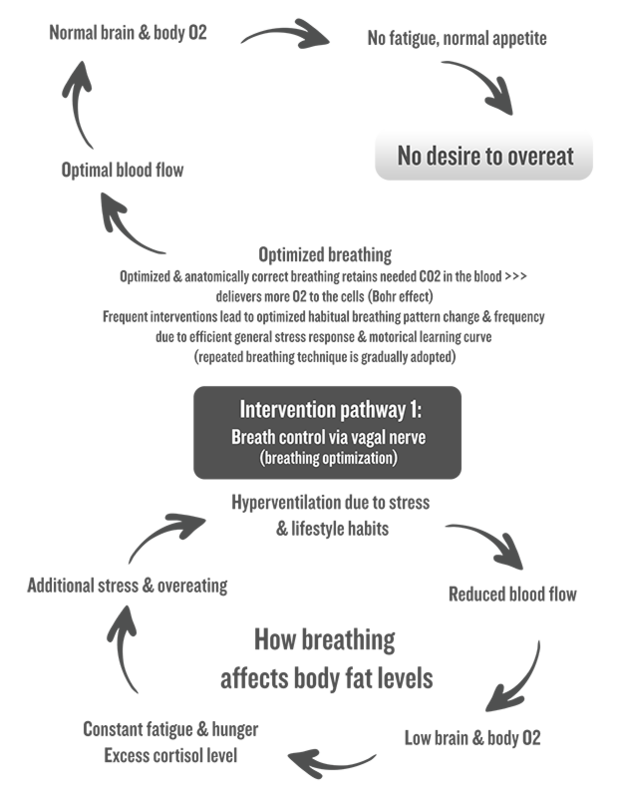 This is what leads to the optimal weight.